The Global Volcanism Program has no activity reports for Valles Caldera. The Global Volcanism Program has no Weekly Reports available for Valles Caldera. The Global Volcanism Program has no Bulletin Reports available for Valles Caldera. The 22-km-wide Valles Caldera was formed as a result of two large-volume eruptions that created the widespread Bandelier Tuff ignimbrite plateaus on all sides of the caldera. The lower member of the Bandelier Tuff, the Otawi, was emplaced about 1.7 million years ago (Ma) and resulted in the formation of most of the present-day caldera, including the Toledo embayment at the NE side. The upper member, the Tshirege, is dated about 1.2 Ma, and also deposited voluminous welded pyroclastic flows over about the same area as the Otawi. Post-caldera volcanism has included the emplacement of multiple ring-fracture lava domes and uplift of the caldera floor, forming the Redondo Peak resurgent dome. The El Cajete Pumice, Battleship Rock Ignimbrite, Banco Bonito Rhyolite, and the VC-1 Rhyolite were emplaced during the latest eruption, about 50,000-60,000 years ago. Seismic investigations show that a low-velocity zone lies beneath the caldera, and an active geothermal system with hot springs and fumaroles exists today. Bailey R A, Smith R L, 1978. Volcanic geology of the Jemez Mountains, New Mexico. New Mexico Bur Mines Socorro Circ, 163: 184-196. Goff F, Gardner J N, Baldridge W S, Hulen J B, Neilsen D L, Vaniman D, Heiken G, Dungan M A, Brixton D, 1989. Excursion 17B: volcanic and hydrothermal evolution of Valles caldera and Jemez volcanic field. New Mexico Bur Mines Min Resour Mem, 46: 381-434. Heiken G, Goff F, Stix J, Tamanyu S, Shafiqullah M, Garcia S, Hagan R, 1986. Intracaldera volcanic activity, Toledo caldera and embayment, Jemez Mountains, New Mexico. J. Geophys. Res, 91: 1799-1816. Reneau S L, Gardner J N, Forman S L, 1996. New evidence for the age of the youngest eruptions in the Valles caldera, New Mexico. Geology, 24: 7-10. Self S, Wolff J A, 2005. Outstanding issues about relationships between large-scale calderas, ignimbrite volumes, and magma body shape and longevity. Workshop Caldera Volcanism: Analysis, Modelling and Response, Parador de las Canadas, 16-22 October, 2005, Abs, p 15. Self S, Wolff J A, Spell T L, Skuba C E, Morrissey M M, 1991. Revisionst to the stratigraphy and volcanology of the Post-0.5 Ma units and the volcanic section of VC-1 core hole, Valles caldera, New Mexico. J. Geophys. Res, 96: 4107-4116. Smith R L, Bailey R A, 1968. Resurgent cauldrons. Geol Soc Amer Mem, 116: 613-662. Wolff J A, Gardner J N, 1995. Is the Valles caldera entering a new cycle of activity?. Geology, 23: 411-414. The Global Volcanism Program is not aware of any Holocene eruptions from Valles Caldera. If this volcano has had large eruptions (VEI >= 4) prior to 10,000 years ago, information might be found on the Valles Caldera page in the LaMEVE (Large Magnitude Explosive Volcanic Eruptions) database, a part of the Volcano Global Risk Identification and Analysis Project (VOGRIPA). There is no Deformation History data available for Valles Caldera. There is no Emissions History data available for Valles Caldera. 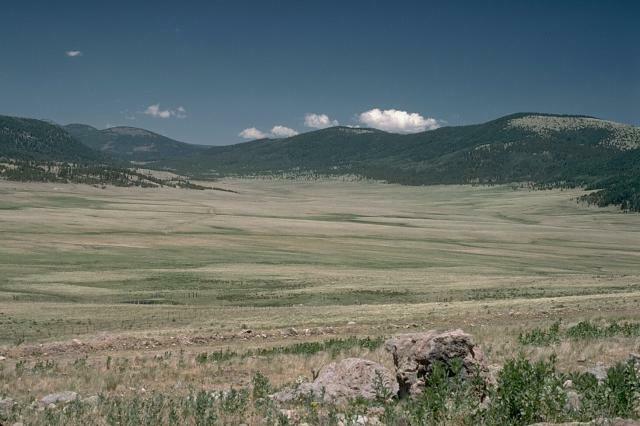 The Global Volcanism Program has no photographs available for Valles Caldera. The following 153 samples associated with this volcano can be found in the Smithsonian's NMNH Department of Mineral Sciences collections, and may be availble for research (contact the Rock and Ore Collections Manager). Catalog number links will open a window with more information. Large Eruptions of Valles Caldera Information about large Quaternary eruptions (VEI >= 4) is cataloged in the Large Magnitude Explosive Volcanic Eruptions (LaMEVE) database of the Volcano Global Risk Identification and Analysis Project (VOGRIPA).